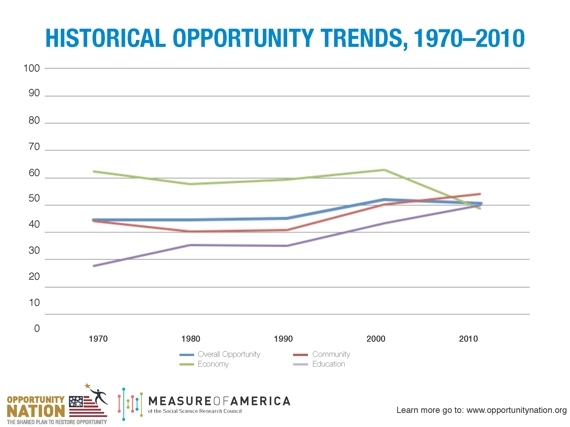 Opportunity in America: Has It Increased or Decreased Over the Past Four Decades? Central to our identity as Americans is a shared belief that, no matter how humble your origins, with hard work and perseverance, you can improve your prospects and give your children a shot at a secure and productive future. For generations, social mobility was a reality, and many Americans were able to climb the ladder to economic security. But today, the American dream is too often just that—a dream. Increasingly, it’s your zip code that shapes your destiny. “Historical Report of Opportunity,” the first statistical measure of national and state opportunity levels over the past four decades, uses publicly available data to provide a holistic picture of how the climate for opportunity has changed in all 50 states and Washington, D.C. The analysis uses data from 1970, 1980, 1990, 2000, and 2010, enabling comparisons of ten key indicators: unemployment rate; median household income; poverty rate; income inequality; preschool enrollment; on-time high school graduation; post-secondary completion; disconnected youth rate; violent crime rate; and access to medical doctors. The data show that overall much of the growth in opportunity is fueled by advances in education. Yet troubling negative trends, such as a rise in poverty since 2000 and increasing youth disconnection (16-24 years old not in school nor working) since 1990, impede upward mobility. The report was jointly developed by Measure of America and Opportunity Nation, with significant contributions from Joshua Greenstein. • Income inequality increased nearly 30 percent at the national level between 1970 and 2010, and also in each of the 50 states and Washington, D.C.